The NPCs in Skelattack have lots of hidden areas to lurk in during raids, but what about daily living? It became apparent that I’d need to design some real housing for them to get cozy in once the coast was clear of threats. 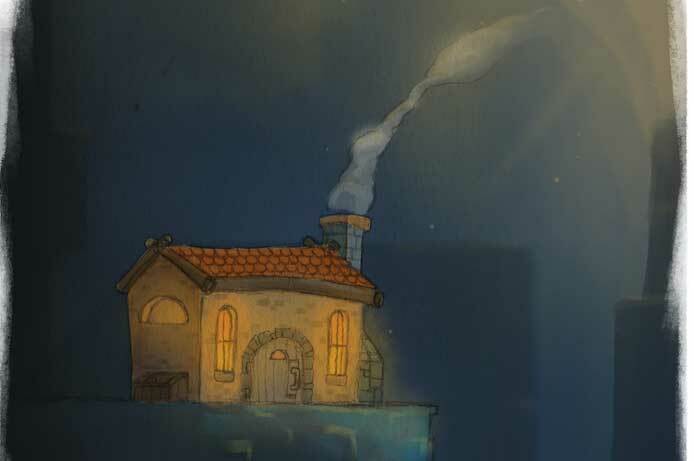 As of this writing I don’t plan to let the player go inside the houses, but the buildings still have some interesting stories to tell without using words at all! In 2016 I painted the concept above when Skelattack was well underway. At the time I wasn’t sure if I could make it work in the game. The idea of this beautiful warm cottage existing in a cold underground dungeon kept me very excited and inspired, as the very idea seemed to contradict itself. I'm finally at a place where I can focus on these things, and I feel better than ever about taking on the challenge. 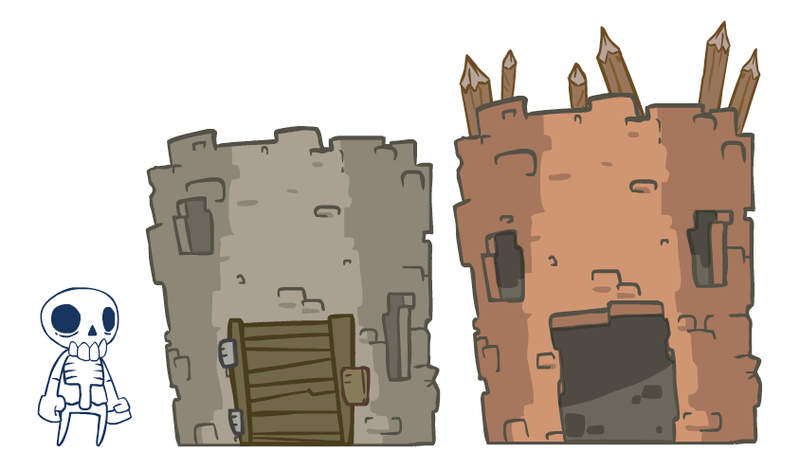 Designing homes for Skelattack turns out to be a lot like designing NPCs. The home can be an extension of their personality. I needed to move away from what my rational mind considered to be a sturdy structure. To properly fit in to the world I’ve built, these homes need to be ancient, leaning, cracked, and made from a wide range of materials. 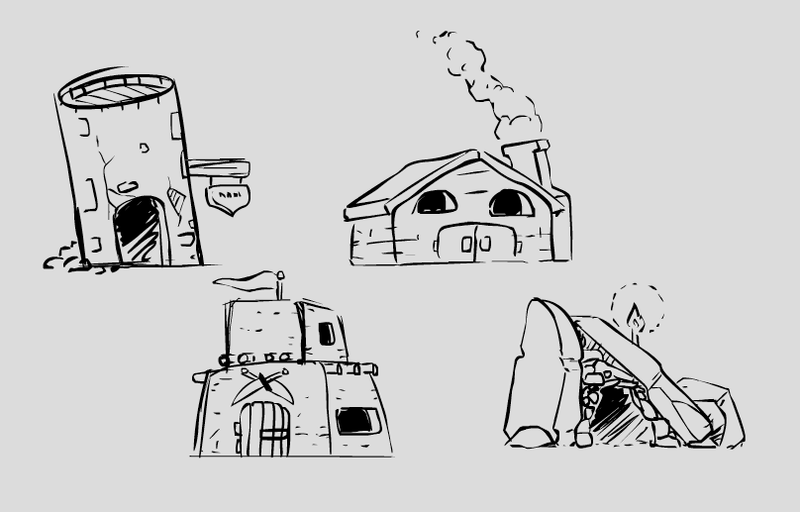 The dungeon dwellers would likely have built their homes with whatever materials were around at the time. Some of them had enough wood to make cozy little cottages. Others created a sort of fortified wood/mud hut. Perhaps some of the rock creatures used their brute strength to create their own boulder caves. They wouldn’t care much for comfort anyway! Above are a few quick concepts I made. Without seeing any characters, can you imagine in which house a friendly skeleton with glasses might live? A tough old goblin who loves to fight? A tired rock golem? Visually interesting designs will push your imagination to create bits of stories and identities that you never considered before. This is the gift that every game developer is able to give to their audience. To work faster, sometimes I'll use a previously-made house as a basis to create something brand new! These designs will also help to reinforce the strange concept that a cold, deadly dungeon can actually be quite inviting depending on how you look at it! Hey! We're not done here just yet. I wanted to let you know about our Thunderclap campaign to raise awareness about the upcoming Kickstarter! If you have played any version of the Skelattack demo and found yourself having a good ol' time, consider adding your voice to ours! Thunderclap makes it super easy to help your favorite creators with an automated post on the platform of your choice. Just hit that link above for more info. See you for my next blog! Say hello on Twitter, okay?